Golding Pearl #11 letterpress. Chase size is 7x11. 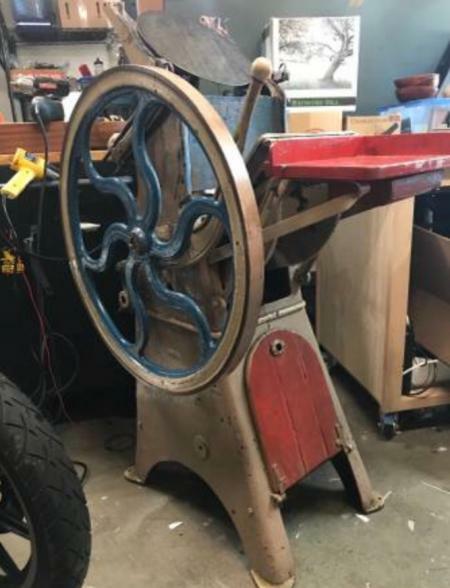 Press is in good working order & includes 3 rollers and trucks; 2 chases; a quoin key & quoin; 2 boxcar bases (one deep, one regular); plus a box of misc. printing supplies. No treadle, but one can be added if desired. I used this press to run my business for 4 years until I bought a bigger one, and have since used this guy exclusively for die cutting. The beauty of the Pearl is that you can run full sized wedding suites but the press is small enough that it can pretty easily be transported and moved around the shop. I have moved it across town to new houses three times using just a hand truck and a pickup truck, so no crazy transportation issues like you have with a larger press. It’s the perfect press for someone just starting out.